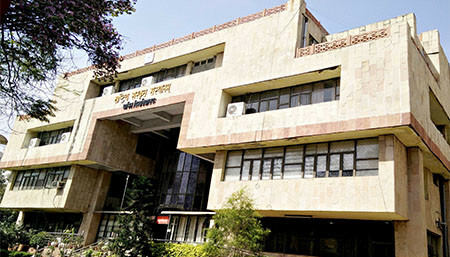 At present Delhi Campus is being run in the office building of Head Quarters of Rashtriya Sanksrit Sansthan situated at 56-57, Institutional Area Janakpuri, New Delhi-58. Correspondence Courses and Distance Education Programmes are conducted by Delhi Campus. This Campus has a library, publication division and research centre etc. * This campus has the following activities- Non Formal Sanskrit Education, Correspondence Course, Distance Education programmes through Delhi Swadhyaya Kendra of Mukta Swadhyaya Peetham, Organizing Seminars/workshops etc, Conducting special short term study programmes through M.S.P. as per the need of target groups, Undertaking research activities. Organizing the following events: Sanskrit Saptah, Sthapana Diwas, National Conference, Yuva Mahotsava, Kaumudi Mahotsava and Akhila Bharateeya Shastriya Spardha.